Ductless is the fastest-growing segment of the HVAC industry, yet there are no great solutions for pricing and in-home presentation – until now. 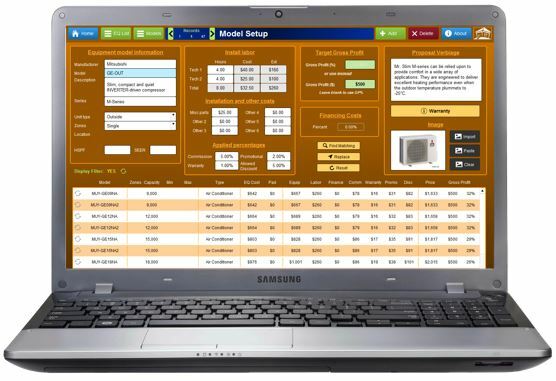 Pro Comfort Advisor is proud to announce the release of ProComHVAC Ductless. Available as a stand-alone program or as an add-on to the ProComHVAC forced-air system. ProComHVAC Ductless will allow you to establish your company’s credibility, educate your customer about ductless systems and present a solution to them in a professional sales-driven process. Works with any and multiple equipment brands! A professional program that is branded to your company and products. Establish credibility with a slide presentation about your awards and accomplishments. Educate your customer about the benefits of ductless HVAC systems with informative videos. Select equipment individually or from a pre-loaded set of matched systems. Build multi-zone systems with confidence. Easily add accessories for system enhancement and performance. 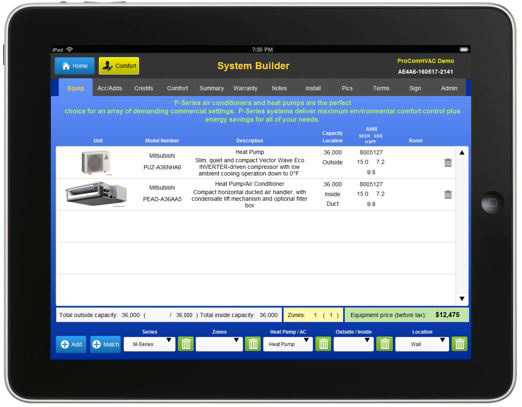 Add items required for a professional installation. Present your recommended solution with prices, descriptions and pictures. “Check the boxes” to show them how your solution takes care of their concerns or goals. Capture a signature right on the iPad. Print or email a professional agreement with a copy back to the office. Copyright © 2018 Pro Comfort Advisor LLC - All Rights Reserved.